The thin line between life and death. 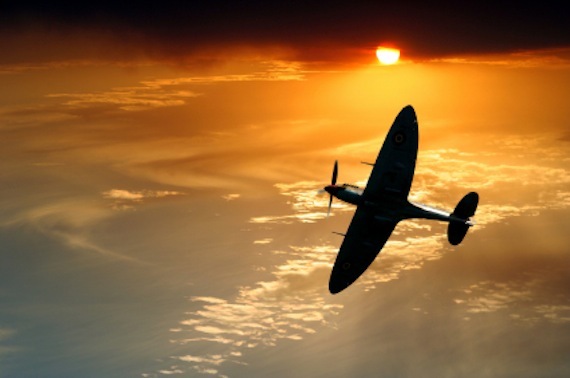 If you know a spitfire pilot – interview them now…. I gave a lecture yesterday at the literary festival held at the London School of Economics, where I am currently a Senior Visiting Fellow. I love the London School of Economics, there is an energy and a vibrancy there which – as my American friends might say – is ‘very special’. My experience of an LSE audience is that you will always get one or two questions that you have never been asked before. True to form that happened yesterday. I was asked why no one had attempted to make something like my series ‘Nazis: A Warning from History’ before. That series transmitted in 1997, more than fifty years after the end of the war. Why hadn’t someone tried to make it twenty or thirty years earlier? Well, in one way, of course, someone had. Jeremy Isaacs’ brilliant ‘World at War’ had been made in the early 1970s, but that hadn’t looked in any real depth at the issues which I tried to examine – chiefly the mentality of the Nazis. There were three reasons which came to my mind as to why the series hadn’t been made before. The first was that TV documentaries didn’t really exist in the form they do now in the immediate years after the war. For technical and other reasons it took until the 1960s for historical documentaries to focus on the past in any remotely comparable way. Then there was the sense that many former Nazis didn’t want to talk openly about the past until they were in their sixties and retired, and finally the whole of my work was revolutionized by the fall of the Berlin wall which allowed, in the 1990s, free access to interviewees in Eastern Europe for the very first time. But there was another reason, which is more psychological. I’ve always been struck how the BBC series ‘The Great War’ about the First World War, which transmitted in the 1960s, focused as much on film archive of the war as on interviewees. Watching the series today one is surprised that they didn’t make the most of their greatest asset – people who actually experienced the Battle of the Somme or Ypres or Verdun. Today, virtually all of them are dead and their personal testimony lost to us forever – unless they were amongst the handful who wrote their memoirs. It’s a reminder to us, I think, of how we take people for granted. We think that because people we know are around today that they will also be around tomorrow. The production team in the 1960s who made the Great War’ must, I suspect, have thought that since lots of people were around who were at the Somme then there was no hurry to interview them. But the line between life and death is both thin and irrevocable. I’ve interviewed many people who saw their friends die in front of them in WW2 – and common to all of these interviewees was this terrible insight that death comes in an instant, yet lasts for an eternity. So if anyone you know has a story to tell – ask them about it today. ‹ How nice are Doctors?